Wordle is an online tool that provides a visual representation of the frequency of words in a given text. I performed the old cut-and-paste of my novel to see what its cloud would look like. 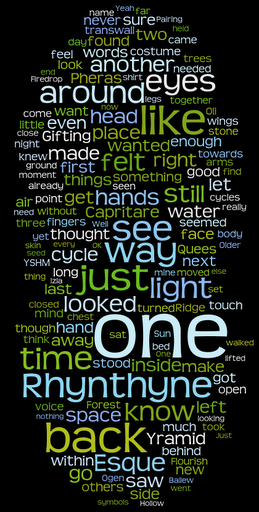 Wordle perfomred its tabulating and formatting functions to spit out this visual version of Capritare. It is interesting to see my novel in this format. I have already begun the process of checking on some of these words to see why they loom so large in the cloud. Alot of “just” iterations have been exorcised! Aren't you interested in ONE? the very central word? Came here via a Google search for novel word clouds. Thanks for the resource! No prob, Jae. Glad the post was here to help. I use this all the time for teaching, too! Great tool.